Welcome to the third edition of MAMA Boards, an AppsFlyer video project featuring leading mobile marketing experts on camera. For today’s mini whiteboard master class, we have Jacopo Guanziroli, Ad Monetization Manager at Social Point, one of the top developers of social games worldwide with over 45 million monthly active users. (Note: Jacopo has since opened his own company, Digital Limbo, for planning and implementing mobile marketing strategies for mobile businesses). He debunks the relationship between ad frequency, engagement, and monetization, and discusses the most important guidelines you need to follow in order to optimize your rewarded video ads’ monetization. Hello everyone, welcome to another session of MAMA Boards by AppsFlyer. My name is Jacopo Guanziroli, I’m the Ad Monetization Manager at Social Point. Social Point’s two main games are Dragon City and Monster Legends and they have more than 100,000,000 downloads on the stores. As we are serving the rewarded videos, you can imagine we have millions of daily impressions. 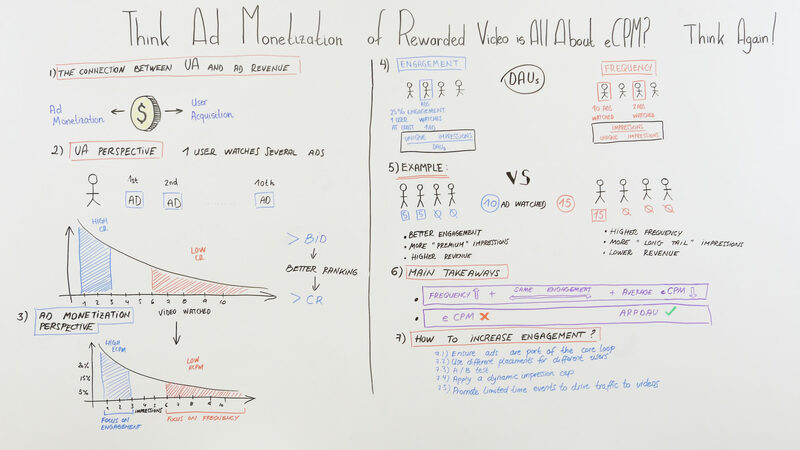 What is the relationship between user acquisition and rewarded ad monetization? 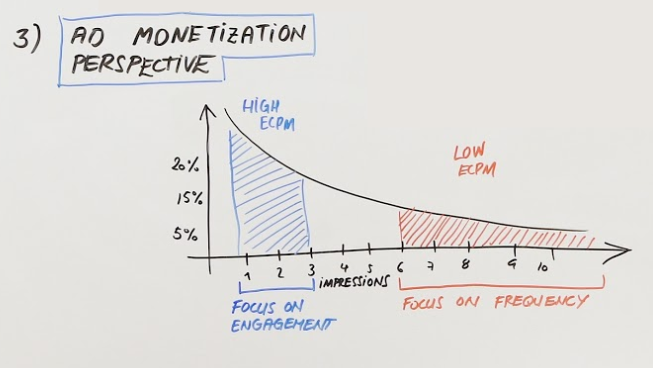 Today, we are going to see that actually eCPM, or “effective cost per thousand impressions,” is not the right KPI to look at if you want to judge the performance on Ad Monetization. Normally, we think, “I see good eCPM – everything is going well. I see lower eCPM – we are doing something wrong,” but actually, it’s not the case. There are more elements to take into account and eCPM is just one of them. So, to start, we’ll take a step back and think about the connection between user acquisition and ad monetization because, ultimately, they are two sides of the same coin. From a UA perspective, when I want to drive installs to my app, I will launch campaigns, which will likely be watched by a user after other campaigns. It means that, the more [rewarded] videos a user watches, the lower their conversion rate [as time passes]. That also means that the first videos a user sees will also be the ones with the greatest influence [for conversion]. This is something that we think about when we are bidding, so the higher the bid will be for our campaigns, the more likely it is to be shown before campaigns of other [competing] advertisers. In short, having a higher bid positions us better within [the advertising competitive landscape] and therefore, the conversion rates will increase thanks to the better ranking. The whole concept can be reflected into Ad Monetization from an Ad Monetization perspective. Basically, when users playing our game engage with the rewarded videos, the more videos they will watch, the lower the conversion rate will be, so the less the advertiser is willing to pay to drive installs to their application. For this reason, I want to introduce you to two new elements here: one is engagement and one is frequency. If we focus on engagement, we focus to have more impressions between 1 and 3, or 4, so the first impression is where we have high value and high eCPM. The more impressions we will have, the lower our CPM will be. Therefore, we will add less value to our Ad Monetization. Let’s make an example here. Let’s say that, in our application, we have four daily active users and only one of them is watching rewarded videos. In this case, one out of four users is engaged, so Unique Impressions divided by Daily Active Users would be 25% – 1 out of 4. If you want to look into frequency, using the same example, we have four daily active users. Let’s say that two of them are watching videos in general, with one of them watching 10 videos and the other one watching two videos. In this case, the total of impressions we are serving is 12 and as we have two unique impressions – that is, two users actually engage with our rewarded videos – our frequency will be six. So, on average, our users are watching six videos. This is really important in introducing my next examples, where we can understand how frequency and engagement can influence the performance of Ad Monetization. In one case, we have four daily active users, where two of them are watching five videos each. So, our total number of impressions for this case is 10. In the other case, we have four daily active users, but just one of them is watching videos. He’s watching more videos actually; he’s watching 15 videos. You might think, well, in this example, more videos are watched and so we will get more revenue. This is actually not the case because, if we look at the graph we were speaking about before, we can see that we are adding impressions with high eCPM in the first example, whereas, in the second example, only a single user is watching many ads. Since we are adding this value to our waterfall, we get low revenue impressions. This is really important because fewer impressions can actually bring more value to our Ad Monetization because of their higher eCPM. With better engagement, we will have more premium impressions and higher revenue, whereas when we have higher frequency but less engagement, we are adding long-tail impressions with lower value – that’s why we can have lower revenue too. So, as we introduce the principle of engagement and frequency, let’s talk about the main takeaways here. If, over time, the engagement in our app will remain the same but we are increasing the frequency such that the same users are watching more ads, what’s going to happen is that our average eCPM will go down – there will be some kind of inflation in our eCPM. That’s why we have to take a step back and look at more factors to understand how to improve our performance. 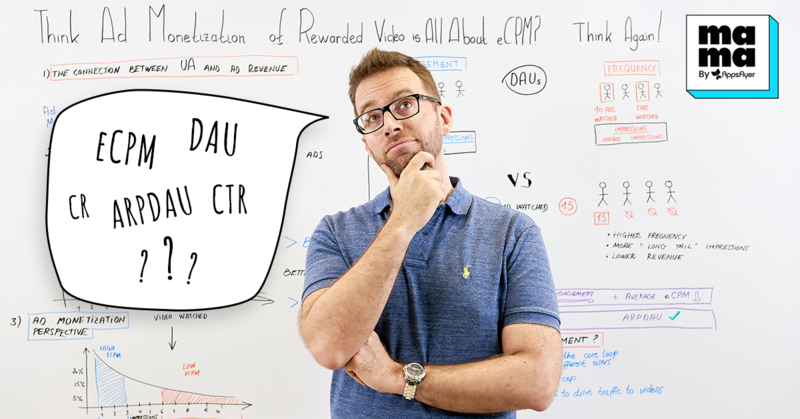 For this analysis, eCPM is not the right KPI to look at – it’s better to look at ARPDAU, which stands for Average Revenue per Daily Active Users. Whenever we make any changes to our app and we want to check if it’s successful, we should look at ARPDAU. If we will have a higher ARPDAU, something good is happening. If it’s going to decrease, however, it creates a negative effect and means we will have to change something. So, as we introduce these two factors, engagement and frequency, and given the importance of engagement, I will give you a few tips on how to increase your engagement. The first tip would be to make sure that ads are part of the core loop. What does this mean? They have to feel like part of the game itself, they have to feel natural. They shouldn’t interrupt the experience of the player and they have to be appealing – the reward that we will give should be something that the users are interested in. The second tip would be to use different placements for different users. It’s very important to understand which ad is important for each type of user, which means you will have to experiment a lot. For example, you can have a login reward – whenever a user enters the app for the first time of the day, watching a video can double the reward they may receive. Another example – if we have a cool-down, where a user has to wait 10 minutes to open a chest, they can watch a video and cut down the time they have to wait. Therefore, it’s really important that we experiment with many, many ad placements, introducing us to my third tip, which is A/B testing. Testing is really important because every app is different and the combination of ad placements you need to achieve [optimal ad monetization] will be unique. We cannot say that there is one combination that works for all apps, so you have to test it. My fourth tip is to apply a dynamic impression cap. This is very important for containing frequency. If we have four ad placements and each one of them has a cap of 10 impressions, we possibly end up having 40 impressions per day for the same user. This is something we don’t want because if a single user watches 40 videos in one day or one session, these impressions, with their low eCPM, [are added to our measurements] and ultimately won’t contribute a lot of value to our Ad Monetization. So, having a dynamic cap, even watching 10 videos across all the placements we have, we will still ensure that we are providing high eCPM impressions. Finally, my fifth and last tip is to promote limited time events to drive traffic to videos. Simply, you want to have more users connected to your rewarded videos. By introducing some limited time events, users that usually do not watch videos may feel pushed to possibly try them. If we have a limited time event that is available just for this one day, you can get this reward. On this day, also, we will increase the impression cap from 10 to 20, since you might be engaging some users that were not watching videos before. So, that’s it for today. Thank you for watching. If you have any comments, please go ahead and write them below. If you are interested in any of the other MAMA Board sessions by AppsFlyer, please follow the link below here.